According to the theory of demographic transition, Iran is currently in stage four. This is proven by their decreased birth rate, improved medical care and urbanization. However, they are not pleased with stage four. Iran’s supreme leader Ayatollah Ali Khamenei was especially concerned by how the economy might suffer. Therefore, Mr. Khamenei is making it illegal to have permanent birth control procedures such as vasectomies and tubectomies, in an effort to increase birth rates. Although these methods may seem dramatic, there is still little to no increase in population. No matter how hard Iran may try, going against a demographic transition is harder than it may seem. This is because of the population momentum created in earlier generations. As you can see in Figure 1, Iran began stage 1 of their demographic transition in 1960, where there was some population growth. Around 1985, they were at the peak of their growth, stage 2 or 3. This dramatic increase can be explained by the typical decrease in death rates as a result of improved medical care as the country becomes more developed. This coupled with continued high birth rates creates an increase in population commonly know as a population explosion. The transition from stage 3 to stage 4 was very abrupt. The steep decline in population growth was caused by urbanization, increased education of women and use of contraceptives, which lowered the birth rates. Iran’s transition from stage 3 to 4 was particularly significant because of the intense efforts at the time to decrease birth rates. This was achieved through promoting the use of contraceptives and increased propaganda to encourage couples to have less children. Figure 2 displays just what Iranian leaders are afraid of. 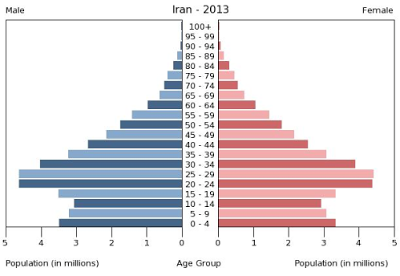 As you can see in this 2013 age structure diagram of Iran, the decline in birth rates has created a smaller generation of young people. If this trend continues, the working class will shrink and the economy will suffer. This decline in birth rates is a proven trend among other countries at stage 4. Once education improves, people become more interested in their careers. This causes many couples to become less interested in having many children. This is exactly what is happening in Iran. However, the government is making an effort to reverse the trend. They are not only using propaganda and giving incentives to couples that have more children, but they are also passing laws against permanent contraceptives. By both discouraging the use of contraceptives and making permanent birth control procedures illegal, Iran has gone too far. They should not have the right to pass a law against these procedures. Not only is Iran wrong about this law, they are also wrong to even try to increase population growth at this stage. There is a reason that growth rate has slow down. In stage 4 of the demographic transition, it is common for families to have around two children because it is has become more expensive to raise children. Couples would rather focus on giving the best possible education and resources to their two children rather than struggle with 3+ kids. Even the incentives that Iran is using are not working because couples are confident and clear on their decision to have fewer children. Trying to fight the process of demographic transition is not a good way to solve economic problems. It might even make it worse. Although the economy will suffer if the trend continues, Iran must find another way to avoid their problems because this solution will clearly fail. Katie, this is an extremely interesting article. I agree with your point; that it is indeed agressive that Iran is making it illegal to use contraceptives. I find it particularly interesting that developing countries aspire to be in stage four and have the same demographic data that Iran has right now. Im also a bit confused on why Iran wants to increase their population. Stage 4 is the ideal place for a country to be and I find it extremely odd that Iran wants to essentially revert its self and move back a stage by limiting birth control. Katie, I have never thought that Demographic transition could bring about negative effects on the population. From what we learned in class, I had always believed that moving from one stage to the next was positive, and was what countries strived to accomplish. But your point of view makes me believe otherwise. Also, the idea of backwards transition had never crossed my mind. In my head it was all forward momentum: now I believe, though it may be hard, it could occur otherwise. Lastly, I have one question: What prompted you to pick Iran as a topic? It’s not a country that comes to mind when thinking about interesting population trends. But what you found was very thought provoking. Katie, I really enjoyed this post! Throughout our class, we have continuously discussed how moving up stages in a country’s demographic transition has been a positive and encouraged change. Countries have taken extremes, such as China, with their One Child Policy (explained in Jasmine Randle’s post “China’s One Child Policy and It’s Implications”), and India, with their forced sterilizations, to decrease their populations and move into the next stage of the demographic transition. What was so fascinating about your post was how it showed not all countries are actually in favor of decreasing their population, in fact Iran actually wants to digress from their stage 4 position in the demographic transition. I agree with you about how trying to force the people to have more children by enforcing laws on permanent uses of contraceptives is wrong. I also agree that choosing to do so for economic gain, causing environmental downfall, is also very wrong. 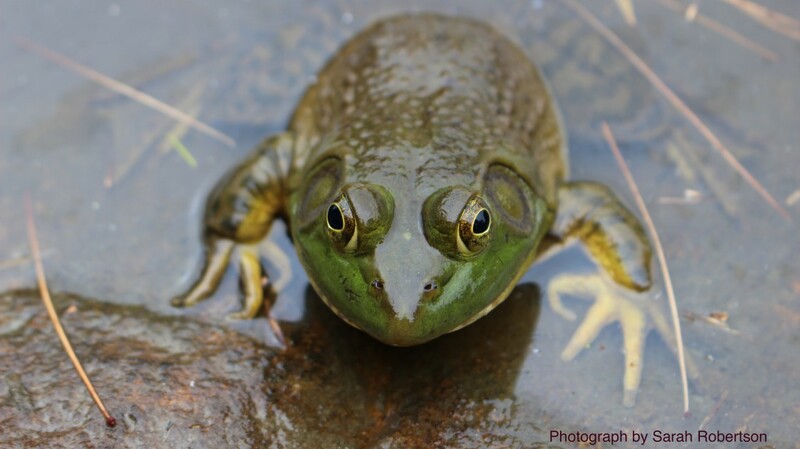 Like Erica Christensen argued in her blog post, “The Decline in the Population Growth Rate is a Good Thing… Or is it?,” the environment cannot fix itself, and the only way for environmental conditions to improve is for the population growth rates to decrease. The economy, although suffers with decreased population, can be improved with other alternatives. Iran’s supreme leader needs to realize the implications of what he is trying to accomplish and needs to come up with other ways of helping their country economically that is not forcing families to have more children.